When deciding upon the best front tiller you have to figure out what your requirements are, so we’ve put together this rototiller buying guide to help you consider a variety of factors before making a decision. Anyone who’s even half interested in gardening knows how important it is to till the soil. Once or twice a year you need to loosen the soil to allow nutrients buried below to come to the surface and dig up weeds. It’s also the best way to churn in compost and other fertilizers, that will improve the quality of flower and vegetable beds. Doing this by hand, using a shovel is back breaking work and it takes forever. By now most of us know the value of using a tiller to make the job mush easier. Most of you probably go out and hire one as you need it. But is this really the best option? So spring is here and it’s time to get the garden ready for summer planting. You head off the hire shop and half the neighborhood has the same idea. So you stand in a line among all the other enthusiastic gardeners waiting to be served. An hour or two later you’ve successfully got the machine, loaded it, headed back home, offloaded it, set it up and you’re ready to get cracking on the task of churning the soil. By now a lot of your enthusiasm has died down and the hours are passing rapidly before you have to load up the machine and get it back to the shop. So you set, rather resentfully to work and get the job done on time. Have you stopped to think of all the wasted time and money that you’ve brought upon yourself? Take the cost of hiring the machine each time and once you’ve added a few dollars for the gas it takes to travel to and from the hire shop, multiply that by the number of times that you’ve hired the machine and you can be pretty sure that it’s not worth the cost. That’s not to mention all the time, stress and extra labor it takes just collect and return it every time. In theory, it seems to make no sense to hire when you look at all of these factors. To test this theory, I set about to find out what the opinion is among those who have actually made the decision to buy one. This meant not only hearing first hand, but spending hours going through gardening blogs and discussion forums to get a good idea of what people really think. I can truthfully say that everyone I came across agreed that buying a front tine tiller is a worthwhile investment, and this was even the view of less enthusiastic gardeners who only use it once a year. One thing that I didn’t think of, but that many people pointed out, is that having a tiller in the shed makes you more likely to use it. This actually makes a lot of sense. Let’s say that you’ve been planning for years to get a vegetable garden going so that you can enjoy fresh, healthy, organic veggies at a fraction of the price that you’d be paying at the store. The problem is that every time you hire a tiller, you barely get done what you have to before it’s time to return it. So every time you promise yourself that next year you’ll work faster or better to make time for that elusive veggie garden. If you had the machine standing there waiting to be used, you’d get cracking on the veg patch the next weekend or whenever the mood grabs you. There seems to be no good argument for not buying one. Though, before you set out and fork out a few hundred dollars for a new front tine tiller, it would be a good idea to arm yourself with some useful information. This article is intended to help you make an informed and educated decision. We’ll start off by looking at what exactly a front tine tiller is and how it works so that you know more about what you’re buying. We’ll also offer loads of helpful tips on choosing and safely using it and finally get around to offering the choice from our selection of the best front tine tillers. What is a Front Tine Tiller? You may well have used a front tine tiller many times and not really known what exactly it is or how it works. If you want to set out and buy the best front tine tiller, it would be wise to know a bit more about them in order to know what to look out for. Buying a piece of gardening equipment of this nature is quite an investment and you don’t want to find out too late that you didn’t make the best choice. First off, let’s distinguish between a front tine tiller and a rear tine tiller. The basic difference, when you look at them is that with a front tine tiller, the tines are in front of the engine and as you might have guessed, a rear tine tiller has the tines positioned behind the engine. The different position of the tines will determine which one works best for you. The Southland SRTT196E is powerful rear tine tiller for larger yard projects. A rear tine tiller is larger, heavier and is not as easy to maneuver. They are usually used for large open areas that require more heavy duty work, so they’re best suited for starting a new garden on an open site. For use in your garden, a front tine tiller is what you’re looking for. They are able to work in smaller areas with a width that is typically adjustable from about 12″ to around 20″. They are also easier to turn which makes them better for working between beds and around trees and other obstacles that you will generally find in the garden. Front tine tillers can be either electric or powered by a gas engine, which is usually four-stroke. Gas powered tillers are most common because they are more powerful. The engine size will be between 150cc and 250cc, depending very much on their size and working depth. A four-stroke is engine is best for this type of use because you get better low-end torque. This means that you get more power at lower revs and it will be less likely to stall when the revs drop while moving through soil that is harder to get through or cutting through thicker roots. The tines are sharp edged blades that move in a circular motion, churning the soil and cutting through roots that lie in the underlying soil. Good quality tines are made from hardened steel which enables them to work in tougher conditions. The tines are adjustable for tilling depth – anything from around 4″ up to around 20″ on larger models. The depth adjustment is a simple device that operates using an adjustable rod at the back that controls how deep you are able to push the tiller down into the ground. Safety is very important, so make sure you read the safety section of your instruction manual and follow all the manufacturer’s safety tips carefully. Wear boots, long pants, and safety glasses when operating the machine. You’re going to be operating a machine that has strong cutting power and want to be able to concentrate on what you’re doing, so make sure that children and pets are not around to get in the way. Before you start working remove any rocks and chop thick roots with an ax, this will protect the tines from unnecessary damage. If you’re using a two-stroke machine check that you have the correct oil to gas ratio. On a four-stroke engine, check that the engine oil is at the correct level. Set the tines to the depth that you want and the machine will churn to this depth as you push it forward. If you start working at the maximum depth, you’ll have to work harder to push the machine due to the fact that you will encounter greater resistance from the volume of soil that you are moving. To work lighter you can start by not going too deep. This will mean that it’s going to take longer because you’ll be coming around a second or third time, each time increasing the depth – but it will take less physical effort to push the machine. Remember you’re not hiring the tiller, so if you take an extra day to finish the job it won’t cost you any extra and you won’t feel as much strain on your back and shoulders if you work your way through the depth settings and rest in between. As always look for a quality machine that’s going to give you reliable service for many years. Spending a few dollars extra today will spare you a lot of stress down the line when it comes to spares and dealership service. You might not know too much about these machines but don’t worry, in the next section, we’ll look at four of the best front tine tillers in order to make your decision easier. Choose something that is the correct size for your needs, so look at tine width to see if it can work in narrow areas if that’s important or if you’re looking at working in larger areas you may well want something a little wider. If you’re worried about storage space you may also want a smaller machine and for some people, the weight could be important when using it and moving around. 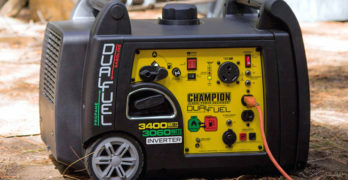 When it comes to engine size, you can be pretty sure that if you’re buying a reputable brand, the engineers have calculated the best engine for the size and cutting depth of the machine. So, again the emphasis is on buying a quality machine from a trusted brand. The wheels are fairly important. Larger wheels at the back of the tiller make it easier maneuver in softer soil and across the driveway or any areas that you need to cover between storage and use. Having covered these basics, all that’s left to do is to review the best front tine tiller and help you choose the perfect one for you. All of the models we are going to review come highly recommended. Some may have better features, some may be cheaper. There are different sizes that will suit different user preferences. So you can select any of these models with confidence, knowing that you’re buying a quality piece of machinery. Consider the tips mentioned above to help you decide which of these are going to work best for you. Ideal for homeowners who want to prepare garden patches & flower beds effortlessly. Power Forward and Reverse : One gear forward and one reverse, for easy operation, maneuverability and transport. OHV Engine : Powerful overhead-valve engine provides the torque necessary to cultivate the most compact earth. ✓ View or download the MANUAL for the Husqvarna FT-900 front tine rototiller. I’ve used (and reviewed) quite a number of Husqvarna garden products over the years and may be a little biased in saying that I rate them very highly. They are always very dependable machines and spares are readily available even as the model becomes older. You always get a great level of dealer service, so you can be assured that you’re getting many years of satisfying use. The Husqvarna FT-900-CA is a good size and weight for the average garden user, that’s if you consider 100 lbs to be a good weight. This might be a little heavy to lift but you won’t really be doing too much of that. The large sturdy rubber wheels will make moving it about an easy task. The 12.69 cubic inch (208cc) overhead valve (OHV) Briggs and Stratton engine is a reliable workhorse delivering 9.5 lb-ft of torque whilst rotating the blades at 118 rpm. This is ample power to dig in most soil types and the tines are rated for a 6.5″ working depth. It has 6 depth adjustment steps, so you can easily choose the exact depth that you want to work at. A 26″ working width gives you a good deal of coverage and versatility for working in more narrow areas of the garden. It has both forward and reverse gears, which gives it added maneuverability. The four blades are driven by a chain through the single speed transmission. 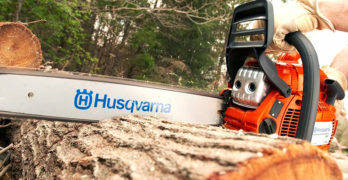 Being a Husqvarna product you can be sure of workmanship and quality that is backed by one the most comprehensive warranties available, with some components being covered for five years and the majority of components being backed by a two or three-year warranty. As with most warranties, this is a limited warranty, but with very reasonable conditions. Designed with patented Bolo tines for improved efficiency. Patented Bolo curve design allows the tines to cut and dig at an offset angle to easily break ground. Innovative swept-back angle turns easily under the soil. ✓ View or download the MANUAL for the Troy-Bilt Colt front tine rototiller. The Troy-Bilt is another quality product and is also powered by a 208cc OHV engine that drives the tines by using a chain through a single speed transmission. It’s a bit heavier than the Husqvarna, weighing in at 136 lbs. The extra weight is quite manageable considering that it’s equipped with impressive 8″ durable rubber wheels. The width is adjustable between 13″, 22″, 24″ making it a very handy machine for working in different sections of the garden. The tilling depth is adjustable up to 8″, which gives you an extra 1.5″ over the previous one. This model only comes with a forward gear and that makes it less user-friendly than the Husqvarna, which is the only model we’ve reviewed that has a reverse gear. So there are some definite pros and a few cons to the Troy-Bilt, which is also a sturdy, well-built machine from a trusted name. It is backed by a 2-year limited warranty and a lifetime warranty on the transmission – which doesn’t count for too much as it only has one forward gear, so there really isn’t too much that can go wrong. All the same, you’re covered by a good warranty and you can be confident of your purchase. ✓ View or download the MANUAL for the Southland SFTT142 front tine rototiller. The SFTT142 is a very attractive option especially considering it’s a fair deal cheaper than the previous two. You will be getting a little less, which makes sense since you’re paying less. The first thing I noticed about this model is that the wheels are a bit smaller (6.5″) and appear not to be as rugged as the more expensive models, so it may be a little more tough to move around. I couldn’t get the weight specifications for it, but I would guess that it will be somewhat lighter because it has a smaller 150cc engine. The lower weight will make the smaller (and perhaps less tough wheels) less of a problem. Of course, the smaller engine means less power and it only delivers 5.75 ft/lbs of torque. This is pretty good power overall but the models with larger engines will fair better in harder soil. The power is delivered to the tines using a poly-V belt system. This is the only one we’ve looked at that doesn’t use a chain and the manufacturers say the V-belt system has a longer life – I’m prepared to take their word for it. Self-sharpening tines ensure you’re working at optimal efficiency. It has pretty much the same width – adjustable for 11″, 16″ and 21″. It does, however, have quite a bit more depth at 11″. This seems surprising since it has the smallest engine. I’m pretty sure that you’ll only be able to use the maximum depth setting on softer soil, there’s no evidence that I can find to back this statement, it just seems logical to me if I look at the difference in power from the engine. The Southland Outdoor Power Equipment SFTT142 may be a cheaper less powerful machine that the previous two but it deserves its place among the best front tine tiller list. It is a good quality machine, offers excellent value for money and is backed by a 2-year warranty. Poulan Pro is an affordable brand balanced with solid build quality. ✓ View or download the MANUAL for the Poulan Pro HDF900. Last but not least we have the Poulan Pro HDF900, which is also a very affordable option. Out of the two cheaper options, this one doesn’t sacrifice engine power for affordability and it has a 208cc engine like the first two, more expensive models. It weighs pretty much the same as the Husqvarna at 108 lbs, but like the previous one we looked at, I’m not sure that the wheels are up to scratch in terms of usability and quality. I might me making a bit too much fuss about the wheels, considering that they are cheap and easy to replace. That being said, quality is everything – even in the details. For the rest, it deserves its place among the best, with very similar features: adjustable 6.5″ working depth and a width of up to 26″ – which is the most impressive width of the lot. It’s also chain driven, which seems to be the most common among all front tile tillers. The all round build quality seems really good, except of course for my nagging obsession with the wheels. You can expect many good years of service from this baby and it also comes with 2-year warranty. Conclusion | What’s the Best Front Tine Tiller? Like I said in the beginning of this review, I may be a little biased, but my first choice would be the Husqvarna. It’s trusted for its quality, not that I’m saying the others aren’t, but if you take a look at the Husqvarna warranty agreement you’ll get a sense of how seriously they take their reputation for building quality machines. The Husqvarna is the only one with a reverse gear, which might be helpful in a tight spot. The Troy-Bilt has its merits too, mind you, most noticeably the extra working depth – which if you consider that its sole purpose is to churn deep into the soil, this counts for a lot. If I put my personal bias aside it would be a very even match between the two. Basically, there are two contests here, one between the more expensive two and then between the cheaper two. If you’re prepared to spend a bit more, your choice will be between the Husqvarna and the Troy-Bilt and in the end, it should be about which has the features that you most prefer. When it comes to the lower priced models the Poulan has the edge it terms of power, so this makes it a good bet. However, the Southland Outdoor has a very impressive working depth and if you don’t have exceptionally hard soil to work in, this might really appeal to you. So take a look at the features in relation to your needs and gardening conditions, do your sums to determine which fits into your budget and make the choice. You can be sure that you’re spending your money on a machine that comes highly recommended and won’t disappoint you in terms of quality.